Joint pain is an interesting animal. Everyone has it at some point. For many people, it's only an occasional problem -- easily taken care of by a single aspirin or some Ben Gay (or by some Essential Relief™ for that matter). For others, though, it's a chronic problem, reducing them to a lifetime of dependency on high doses of NSAIDS or prescription drugs. Over the years, before they were all the rage, Jon Barron recommended Glucosamine and Chondroitin sulfate. He also recommended CMO (cetyl myristoleate), MSM, Fish oil, Boswellia, and Proteolytic Enzymes, and others since the causes of joint pain and cartilage destruction are varied and no solution works for everyone. We are going to talk about another alternative for those who still suffer from joint issues. It is called Avocado Soy Unsaponifiables, or ASU, and it helps repair and rebuild damaged cartilage in the weight bearing joints. Aggrecan is the acronym for a small bio-chemical molecule called, oxymoronically, the large aggregating chondroitin sulfate proteoglycan. Specifically, an aggrecan molecule consists of a protein backbone, which is attached to up to 150 chondroitin sulfate chains and 60 keratan sulfate chains. Aggrecan is abundant in the human body and represents up to 10% of the dry weight of cartilage -- keeping in mind that's quite substantial since articular cartilage (the cartilage found at the end of long bones) contains up to 75% water. As many as 100 of these aggrecan monomers will then interact with hyaluronic acid molecules to form a single massive chain called an aggregate, which is a key component of joint cartilage. 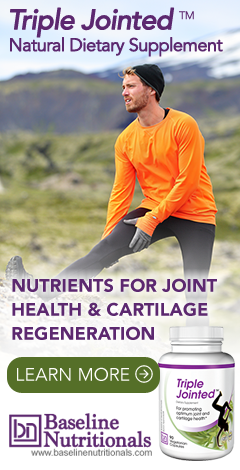 Aggrecan plays a crucial role in the functioning of articular cartilage (the cartilage found in joints), primarily working to maintain high levels of hydration in the cartilage -- thereby keeping the cartilage healthy and functional. As a side note, it is the presence in aggrecan of large numbers of chondroitin sulfate chains that is primarily responsible for the osmotic pressure that results in articular cartilage being 75% water. Several years ago, researchers from the University Hospital in Liege, Belgium reported in the August 2003 issue of The Journal of Rheumatology that a phytosterol/sterolin extract concentrated from the oils found tightly bound to food for joint health, like avocado and soybean fibers, could significantly boost production of aggrecan, thereby helping slow down and even repair some of the damage caused by osteoarthritis -- in as little as nine days. It should be noted that although eating avocado and soybean oil separately does indeed enhance aggrecan production (somewhat); it is only these special compounds found in ASU extract (made up of one-third avocado unsaponifiable and two-thirds soybean unsaponifiables) that restore aggrecan synthesis blocked by the inflammation-causing compound interleukin-1-beta. In addition, ASUs also reduce levels of several other inflammatory factors such as MMP-3 production. In other words, ASU is not the same as avocado and soy oil. It is specially extracted from the fiber of avocados and soy. The problem is that before extraction, the ASUs are so tightly bound to the fiber, that they are mostly unusable by the human body. ASU has been sold in Europe in a purified form for several years now as a prescription drug. As such, it has a number of studies supporting its effectiveness. For example, in a double-blind trial, 260 individuals with arthritis of the knee were given either a placebo or purified ASU at 300 or 600 mg daily. The results over 3 months showed that use of ASU significantly improved arthritis symptoms when compared to a placebo. If you've tried Chondroitin sulfate, Glucosamine sulfate, MSM, CMO, whatever, and none of them have worked for you, then avocado unsaponifiable or ASUs or offer an exciting alternative. Learn more about natural anti-aging.